Dena DeCamp, president of the Florida Federation of Republican Women, receives the seventh biennial Ronald Reagan Leadership Award in September 2017. 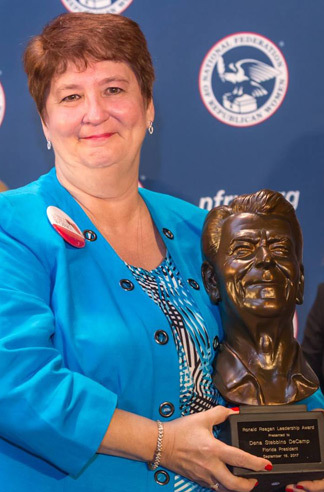 The Ronald Reagan Leadership Award honors a state president who has provided extraordinary leadership and inspiration to her state and to the NFRW. The Betty Heitman Awards for State Excellence are presented to states that demonstrate excellence, achievement or accomplishment in community relations, programs, campaign activities and state functions. The Club Achievement Awards are presented to clubs that demonstrate excellence in membership development, campaign activities, community relations, programs and club functions. The Caring for America Awards are presented to states and clubs that demonstrate excellence in community service and outreach. The Campaign Volunteer Awards are presented to states that demonstrate excellence in donating volunteer time to the benefit of the Republican Party, Republican candidates, or the NFRW. The State Public Relations Awards recognizes states that do an outstanding job of improving Federation visibility and attracting media coverage of Federation accomplishments. The Membership Incentive Awards are presented to states and clubs that demonstrate excellence in the area of membership development. MEMBER TIP: Download the award applications by logging in and visiting the Digital Resource Library.